This racetrack blows all American, European, and Asian ones out of the water. This race is located in Abu Dhabi. Why? Located at the crossroads between Europe, Asia and Africa, Abu Dhabi [the capital of the United Arab Emirates], it is the ideal location to host an event such as the Grand Prix, accessible to millions of visitors and fans within a six hour flight path. Abu Dhabi is one of the world’s fastest growing tourist attractions, named by Frommers Guide and Lonely Planet as one of the top ten places to visit in 2010. The track was designed by renowned circuit architect Hermann Tilke who has also designed the Singapore, China, Korea, and India circuits as well as redesigned some others in Europe. This track was designed for formula 1 racing and has the longest straight on the F1 calendar (F1 cars reach speeds of 320 km/h or 200 mph), tight corners for overtaking and hard braking, and even a twisty street circuit-style sector. Also incorporated are elevation changes, so the track is very diverse and very long at 5.55 km (3.4 miles). The track can be changed to three configurations with the other two configurations being just short of 2 km and separate of each other. This allows for two events to be run at the same time. The full course consists of 12 left and 9 right turns, which is a great for racing and watching. The obstacles and diversity of the track always bring great racing action. Its distinctive design also boasts several innovative elements including the stunning five-star, 500-room Yas Marina Hotel, which straddles the circuit; the 60-metre solar powered Sun Tower, which offers unrivalled views for invited guests; and a pit lane which sees the cars exit via a tunnel passing under the track. The track was also designed with the marina in mind so race enthusiasts could come in on their yachts to enjoy the racing action. Due to the fact that this track is located in the Middle East, during the daytime the track could be extremely hot and could be dangerous. The track has a lighting system that allows it to run events and races during the night when the temperatures drop. The seating area for the spectators is also covered so if an event is held during the day, the spectators could be out of the scorching sun. The track designer of the Yars Mar circuit also designed the new Circuit of the Americas track being built outside Austin, TX for the 2012 US GP. Watch this video to understand the structure and foundation of the track during construction. Incredible. Visit the official website at: formula1.com. It has a great interactive map of the track, destination info, itinerary, and much more. This piece of work and attraction is right by the track. So why not be part of the ride rather than just watch it? 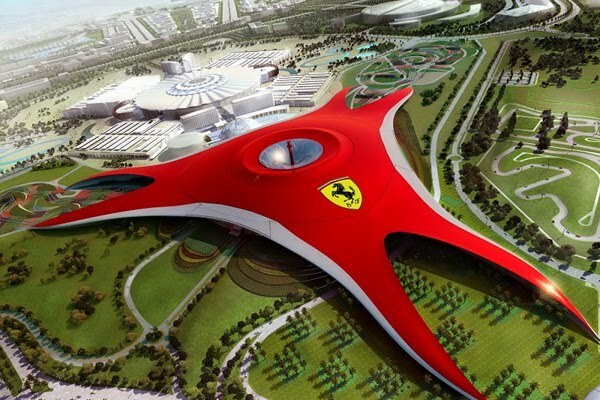 Ferrari World Abu Dhabi is the world’s first Ferrari theme park and largest attraction of its kind. It is an intense multi-sensory experience and a must-visit for families, fans and enthusiasts. Ferrari World Abu Dhabi’s iconic sleek red roof, inspired by the classic double curve side profile of the Ferrari GT body, spans 200,000 SQM, carrying the largest Ferrari logo ever created. The enclosed indoor area accessible to the public is 86,000 SQM – large enough to fit seven football fields “head to toe”. 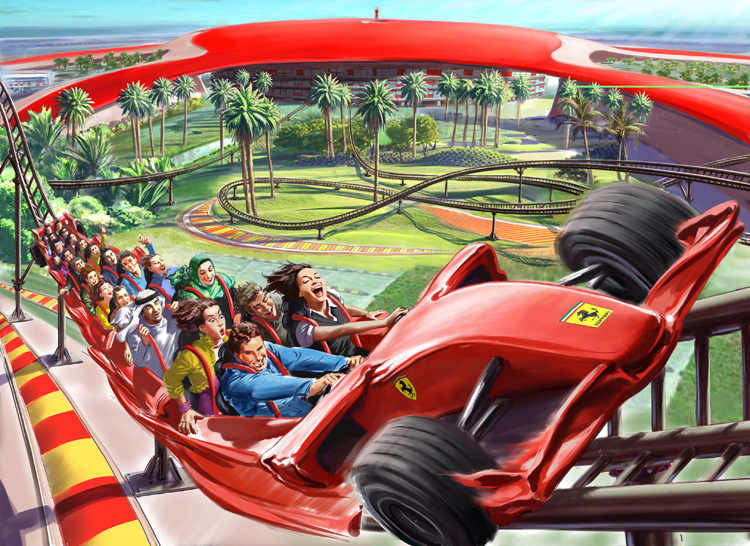 Ferrari World Abu Dhabi will feature more than 20 rides and attractions designed to tell the Ferrari story in ways which will appeal to a broad audience of different ages and interests. From the world’s fastest roller coaster, to advanced racing simulators, driving and scenic experiences; families, children, thrill seekers and racing fans can all find and enjoy unforgettable experiences here. Hey, look! 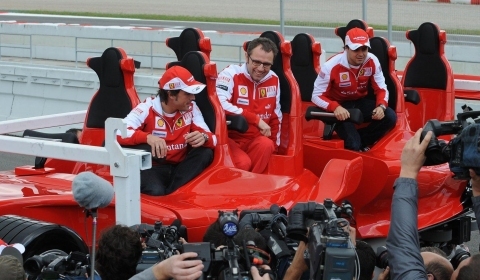 It’s a ride sponsored by Formula 1. But more interestingly, it’s the fastest rollercoaster in the world. All riders have to wear goggles when riding this roller-rocket. You’ll accelerate up to 240km/h and see what 4.8 Gs really feels like. You’ll scream over the track and 52 meters into the sky before flying through the chicanes, inspired from some of the most famous race tracks in the world, and across the finish line, with an adrenaline kick worthy of the Grand Prix.